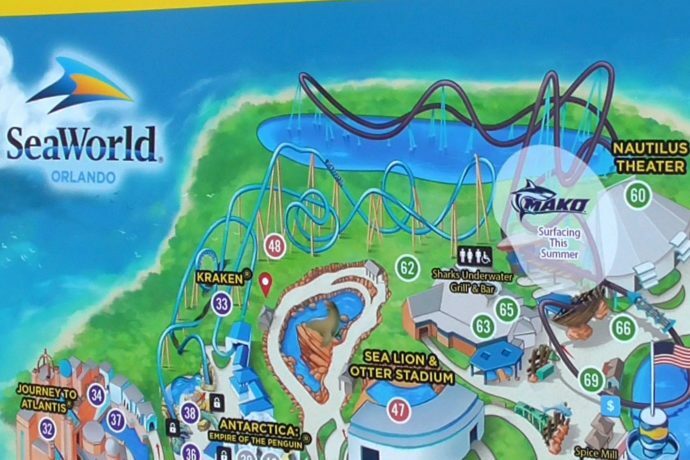 The Mako hyper coaster track’s full circuit is complete at SeaWorld Orlando, but they’re not quite ready to open this new attraction just yet. UPDATE: Mako is planned to open June 10th! The surrounding area theming is starting to take shape. When complete the new “Shark’s Realm” themed land will look like an underwater shipwreck and include the Shark Encounter attraction, Sharks Underwater Grill, and other area shops. For now, the area is named Shark Wreck Reef, but I think that sign might be temporary until the coaster is ready to open. When I was there today there were workers all the way up at the top of the lift hill, 200 feet up. Work is also being done on the track section over the main lagoon. And it’s already listed on the park map, surfacing this Summer! Check out the video as well as snapshots below of the current progress. And stay tuned for more theme park updates coming soon! Perhaps these poles will hold a shipwreck set-piece? Mako on the park maps! That’s all for this update. Check out our last Mako update, with info and concept art! Check out all our Mako updates here and subscribe to the RSS Feed to stay on top of everything theme park Orlando!